Attic Duct Insulation Repair: You may be losing a substantial amount of energy if you have air conditioning and heating ducts in your attic that are not properly insulated. Our attics are often out of sight and out of mind but if you have a heating and cooling system located in your attic (more common in warmer areas) or just ductwork that runs through it, an inspection and, if required, an attic duct insulation repair could result in dramatic savings throughout the year. Ducts are the metal or flexible pipes that circulate the heated or cooled air around your home. 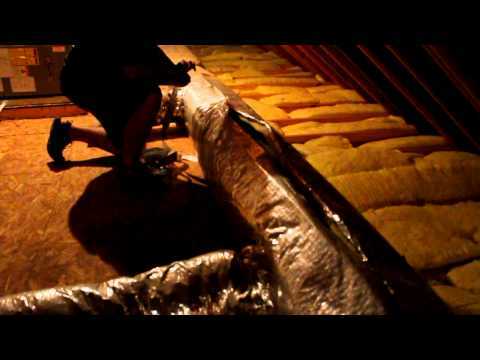 In this video we’ll visit an attic where a portion of the duct insulation has separated from the ductwork and show you how to repair it. It’s a quick easy repair that is really high value. Keep in mind that insulation works by trapping air and it important when doing a duct insulation repair to not compress the insulation as it will take away its insulating capability.